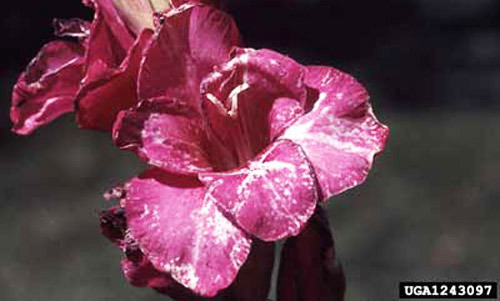 The gladiolus thrips (Figure 1) causes deformities and discoloration of gladiolus flowers, and corms (bulbs) become soft and are prone to decay. Figure 1. Ventral view of an adult female gladiolus thrips, Thrips simplex (Morison). Photograph by Laurence Mound, Australian National Insect Collection, Commonwealth Scientific and Industrial Research Organisation. Courtesy of http://www.padil.gov.au/. Used with permission. 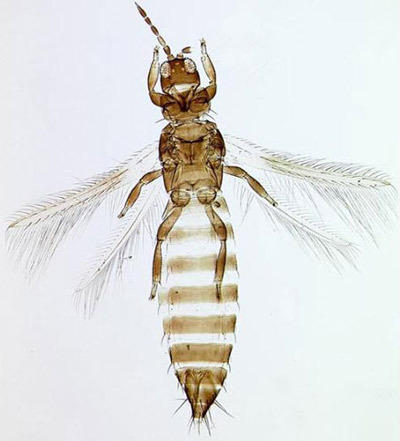 The gladiolus thrips was first described by Morison (1930) as Physothrips simplex from five female specimens collected on carnation flowers, Dianthus caryophyllus, from Urrbrae, South Australia. The holotype and one paratype are deposited in the British Museum. Moulton and Steinweden (1931) described this thrips under the name Taeniothrips gladioli from Ontario, Canada, and it was synonymized by Steele (1935). Bhatti (1969) placed Taeniothrips gladioli in the genus Thrips. Kellie O'Neill of the U.S. National Museum (retired) has suggested that this thrips probably originated in Africa as did its preferred host, gladiolus, Gladiolus x hortulanus. Gladiolus thrips is widespread and is found almost everywhere gladiolus are grown in Africa, southern Asia and Japan, Australia, several Pacific Islands, Europe, and North and South America. In the United States, it is found in almost all states. It was first found in Florida in 1932 (Watson 1941). Although it cannot overwinter outdoors in northern Europe and northern North America, the annual spread of this thrips probably results from its infested corms being shipped to all parts of the country. Adults emerge milky-white, but soon turn brown and begin feeding. The female (Figure 1) is approximately 1.65 mm long and slightly larger than the male. The antennae are dark brown except for the third segment, which is light brown (Figure 3). The wings have a light transverse band near the base. The first vein of the forewing has seven setae on the distal half (Figure 4). Figure 2. 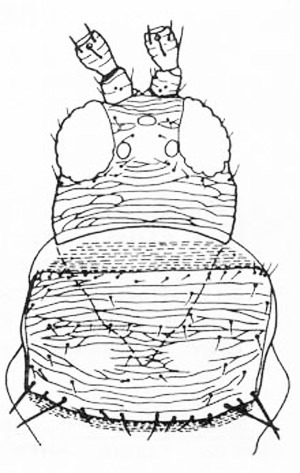 Head and prothorax of the gladiolus thrips, Thrips simplex (Morison), showing setae. Graphic by Division of Plant Industry. Figure 3. Antenna of the gladiolus thrips, Thrips simplex (Morison), showing the light brown segment. Photograph by Laurence Mound, Australian National Insect Collection, Commonwealth Scientific and Industrial Research Organisation. Courtesy of http://www.padil.gov.au/. Used with permission. Figure 4. Forewing of an adult gladiolus thrips, Thrips simplex (Morison). Note the first vein with about seven setae on the distal half. Photograph by Laurence Mound, Australian National Insect Collection, Commonwealth Scientific and Industrial Research Organisation. Courtesy of http://www.padil.gov.au/. Used with permission. The egg is about 0.3 mm long, opaque white, smooth, and bean-shaped. Eggs are deposited in the leave tissue and corms. The two larval stages are light yellow and are usually found beneath the leaves or bracts. The fully developed second instar larva is about the size of the adult. The first pupal stage is distinguished from the second pupal stage by having forward projecting antennae and short wing pads. The second pupal stage, which is a quiescent period, has the antennae folded over the back and much longer wing pads (Figure 6). Figure 5. From left to right: egg and first larval stage, second larval stage, first pupal stage, second pupal stage. Graphic by Division of Plant Industry. The thrips feed and reproduce primarily on gladiolus flower spikes and corms; however, it has been recorded from Philodendron selloum, Clitoria sp., Rhododendron indicum, Calendula spp., and crow-foot grass, Eleusine indica. This thrips has never been reared from these plants and they cannot be considered valid hosts. It was reported to reproduce on Tritonia sp., Tigridia sp., and Kniphofia sp. Figure 6. Flower damage caused by feeding of the gladiolus thrips, Thrips simplex (Morison). Photograph by Whitney Cranshaw, Colorado State University, www.ipmimages.org. Figure 7. Gladiolus corm (right) showing advanced stage of injury by gladiolus thrips, Thrips simplex (Morison). Photograph by Division of Plant Industry. Bhatti JS. 1969. Taxonomic studies in some Thripini (ThysanopteraThripidae). Oriental Insects 3: 373-382. Magie RO, Overman AJ, Gilbreath JP, Waters WE, Wilfret GJ, Price JF, Woltz SS. 1988. Gladiolus corm production. Gladio Grams Bulletin No. 69 2-28. Morison GD. 1930. On a collection of Thysanoptera from South Australia. Bulletin of Entomological Research. 21 9-14. Moulton D, Steinweden JB. 1931. A new Taeniothrips on gladiolus. Canadian Entomologist 63: 20-21. Steele HV. 1935. Thrips investigation: some common Thysanoptera in Australia. Council for Scientific and Industrial Research, Commonwealth of Australia, Pamphlet 54. 59 pp. Watson JW. 1941. The gladiolus thrips in Florida. University of Florida Agricultural Experiment Station Bulletin 357. 23 pp. Authors: H.A. Denmark, Florida Department of Agriculture, Division of Plant Industry, and J. F. Price, University of Florida. Originally published as DPI Entomology Circular 322. Publication Date: July 1998. Latest revision: April 2016. Reviewed: February 2019.